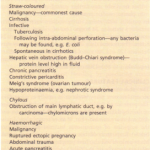 These are best thought of as disorders of body water content. As discussed above, sodium content is regulated by volume receptors; water content is adjusted to maintain, in health, a normal osmolality and (in the absence of abnormal osmotically active solutes) a normal sodium concentration. Disturbances of sodium concentration are caused by disturbances of water balance. Hyponatraemia is one of the commonest abnormalities detected in biochemistry laboratories. It may be associated with normal, decreased, or increased extracellular volume and total body sodium content. 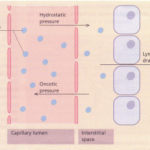 The differential diagnosis of hyponatraemia depends on an assessment of extracellular volume. Rarely hyponatraemia may be pseudohyponatraemia, where in hyperlipidaemia or hyperproteinaemia there is a spuriously low measured sodium concentration, the sodium being confined to the aqueous phase but having its concentration expressed in terms of the total volume of plasma. In this situation plasma osmolality is normal and therefore treatment of ‘hyponatraemia’ is unnecessary. It is also important to exclude artefactual ‘hyponatraernia’ caused by taking blood from the limb into which fluid of low sodium concentration is being infused. This is due to salt loss in excess of water; the causes are listed in Table 10.7. 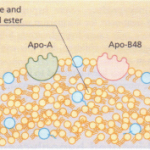 In this situation ADH secretion is initially suppressed (via the hypothalamic osmoreceptors), but as fluid volume is lost, volume receptors override the osmoreceptors and stimulate both thirst and the release of ADH. This is an attempt by the body to defend circulating volume at the expense of osmolality. 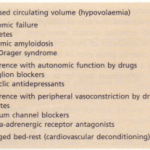 Causes of hyponatraemia with normal extracellular volume. 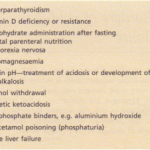 Causes of hyponatraemia with decreased extracellular volume. Average concentrations and potential daily losses of water and electrolytes from the gut. With extrarenal losses and normal kidneys, the urinary excretion of sodium falls in response to the volume depletion, as does water excretion, leading to concentrated urine containing less than 10 mmol litre”! of sodium. However, in salt wasting kidney disease, renal compensation cannot occur and the only physiological protection is increased water intake in response to thirst. With sodium depletion the clinical picture is usuallydominated by features of volume depletion. The diagnosis is usually obvious where there is a history of gut losses, diabetes mellitus or diuretic abuse. the potential daily losses of water and electrolytes from the gut. Losses due to renal or adrenocortical disease may be less easily identified and are suggested by a urinary sodium concentration of more than 20 mmol litre.” in the presence of clinically evident volume depletion. This is directed at the primary cause whenever possible.Increased salt intake as Slow Sodium 60-80 mmol daily is all that is required in the relatively healthy patient who can take this by mouth. In the face of vomiting or severe volume depletion, intravenous infusion of normal saline is given. Potassium supplements and correction of acidbase abnormalities may also be required. This results from an intake of water in excess of the kidney’s ability to excrete it. It is uncommon with normal kidney function, requiring an intake of approximately 1 litre hour-I. Overgenerous infusion of 5% glucose into postoperative patients is one of the commonest causes, in which situation it is exacerbated by increased ADH secretion in response to stress. 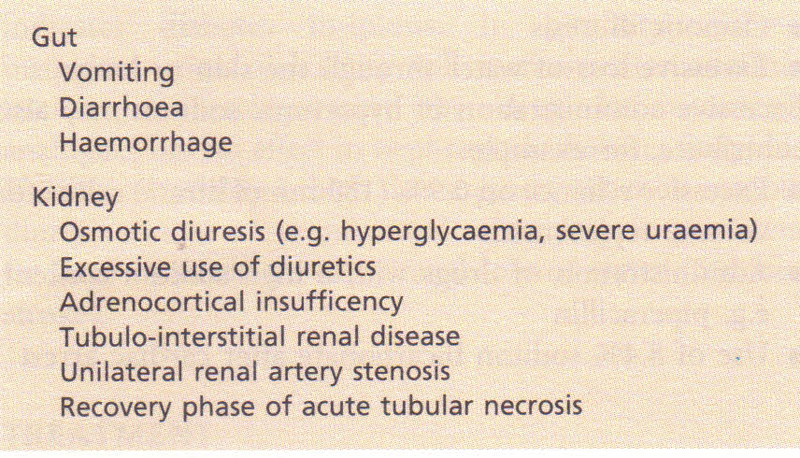 Some degree of hyponatraemia is usual in acute oliguric renal failure, while in chronic renal failure it is most often due to ill-given advice to ‘push’ fluids. Symptoms are common with dilutional hyponatraemia when this develops acutely. They are principally neurological and are due to the movement of water into brain cells in response to the fall in extracellular osmolality. Symptoms rarely occur until the serum sodium is less than 120 mmol litre-‘ and are more usually associated with values around 110 mmol litre ” or lower. Symptoms and signs of hyponatraemia are non-specific and include headache, confusion, and restlessness leading to drowsiness, myoclonic jerks, generalized convulsions and eventually coma. Other features depend on the cause, e.g. signs of congestive cardiac failure or liver disease. • remember potassium and magnesium depletion potentiate ADH release and are an important cause of diuretic-associated hyponatraemia The syndrome of inappropriate ADH secretion is often over-diagnosed. 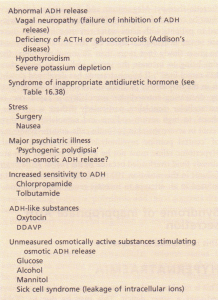 Some causes are associated with a lower set point for ADH release, rather than completely autonomous ADH release; an example is chronic alcohol abuse. The underlying cause should be corrected where possible. Most cases are simply managed by restriction of water intake (to 1000 or even 500 ml per day) with review of diuretic therapy. Magnesium and potassium deficiency must be corrected. The use of hypertonic saline is restricted to patients with acute water retention in which there are severe neurological.signs, e.g. fits and coma. It must be given slowly (not more than 70 mmol per hour) the aim being to increase the serum sodium to more than 125 mmol litre :’. If hyponatraemia has developed slowly, as in the majority of patients, the brain will have adapted by decreasing intracellular osmolality; a rapid rise in extracellular osmolality, particularly if there is an ‘overshoot’ to high serum sodium and osmolality will then result in severe shrinking of brain cells, and the syndrome of ‘central pontine myelinolysis’, which may be fatal. Hypertonic saline must not be given to patients who are already fluid overloaded because of the risk of acute heart failure; in this situation 100 ml of 20% mannitol may be infused in an attempt to increase renal water excretion. Syndrome of inappropriate AD H secretion This is described. Hypernatraemia is always associated with increased plasma osmolality, which is a potent stimulus to thirst. None of the above causes hypernatraemia unless thirst sensation is abnormal or access to water limited. 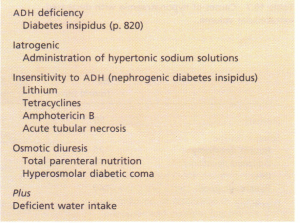 For instance, a patient with diabetes insipidus will maintain a normal serum sodium concentration by maintaining a high water intake until an intercurrent illness prevents this. Thirst is frequently deficient in elderly people, making them more prone to water depletion. Hypernatraemia may occur in the presence of normal, reduced or expanded extracellular volume, and does not necessarily imply that total body sodium is increased. SYMPTOMS of hypernatraemia are non-specific. Nausea, vomiting, fever and confusion may occur. A history of long-standing polyuria, polydipsia and thirst suggests diabetes insipidus. There may be clues to a pituitary cause. A drug history may reveal ingestion of nephrotoxic drugs. SIGNS. Assessment of extracellular volume status is important in guiding resuscitation. Mental state should be assessed. Convulsions occur in severe hypernatraemia. Simultaneous urine and plasma osmolality and sodium should be measured. Serum osmolality is high in hypernatraemia. Passage of urine with an osmolality lower than that of plasma in this situation is clearly abnormal and indicates diabetes insipidus. In pituitary diabetes insipidus, urine osmolality will increase after administration of desmopressin; the drug (a vasopressin analogue) has no effect in nephrogenic diabetes insipidus. If urine osmolality is high this suggests either an osmotic diuresis due to an unmeasured solute (e.g. 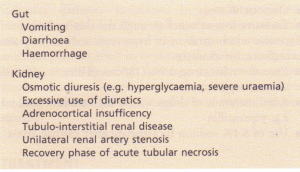 in parenteral feeding) or excessive extra-renal loss of water (e.g. heat stroke).